“It is a combination of classic French techniques, Nouvelle Cuisine and my own history of learning about entertaining through my mom and dad,” says Michael. “I got to pick and choose how to blend all three and create this new style and flavor.” After attending a summer program in Hotel and Restaurant management at Cornell University, Michael visited his brother in Boulder, Colorado. “Boulder was incredible: there were farms all over the place and you could get wonderful produce – everything you could want,” says Michael. He began teaching French cooking classes in French at the University and received his own undergraduate college degree while there. 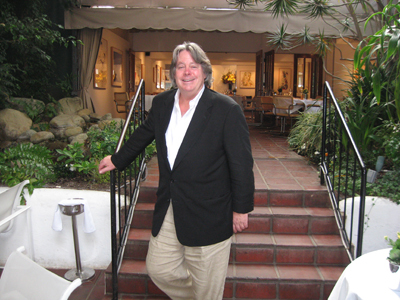 “When it was time for me to move on, I called Lois Dwan, the Los Angeles Times food critic, and asked which restaurants were best in L.A.,” says Michael. “At her suggestion, I got together with Jean Bertranou of L’Ermitage on La Cienega and we brainstormed on what was missing in California. We figured that what you couldn’t get here was the French ingredients, so we started shipping them in from France – arugula, cheese, fish. We started supplying other restaurants, and then started bringing in the seeds to grow the mache, arugulas, haricot verts, heirloom tomatoes, heirloom beets, and other great produce from France. Then we noticed that you couldn’t get good duck here, so we started breeding ducks and created the first foie gras in America. A few years after that in 1987 he opened The Tavern on Main. “My concept was to offer a piece of the East Coast here in the West,” says Russell. “It wasn’t much from the outside but there was a great patio and kitchen inside.” The restaurant is still in operation – he sold it to one of his managers, Rick, who renamed it Rick’s Tavern. 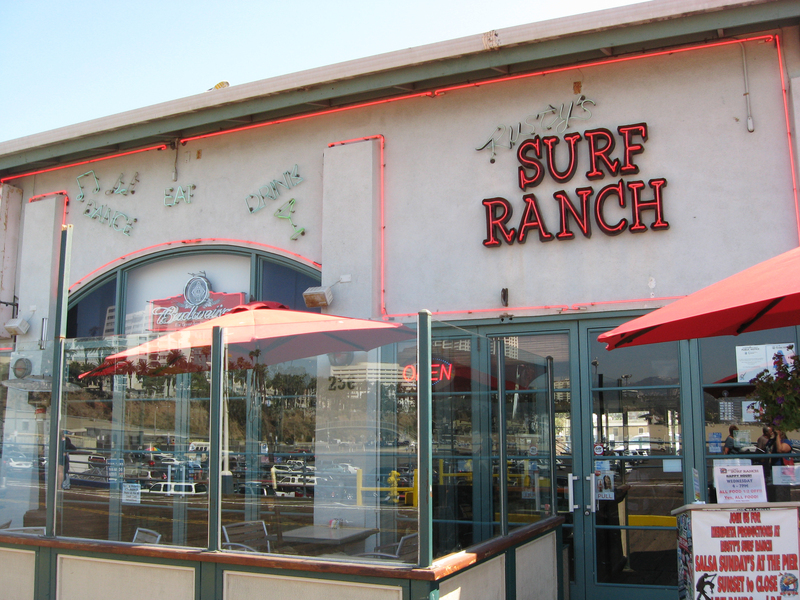 Approaching his 20-year anniversary, Russell recognizes that Rusty’s Surf Ranch has evolved over the years. “The first 5-6 years I was just working with the cooks to develop recipes to suit my palate and appeal to our customers,” he says. “I’m all about listening to the customer, but there are also some quirks – like I’m allergic to bell peppers, so for the first 10 years there were no bell peppers on the menu at all, and even today bell peppers have a low presence on our menu.” About eight years ago Russell worked with Danny Harold to revamp the menu, and it has remained relatively stable since then. The best part of owning restaurants for Geraldine is “I love food, love drinking, and love reading the customer comment cards on Monday mornings. I love creating new stuff, growing stuff, and working with people over time. 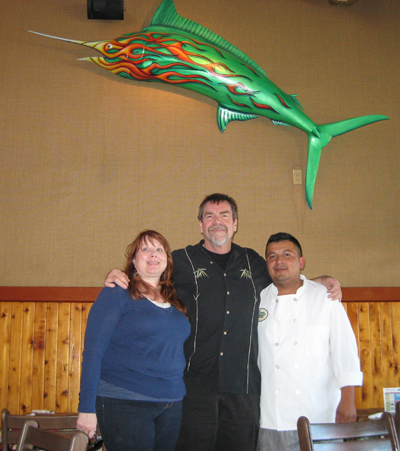 I have good people in my restaurants.” In addition to Lula Cocina, Geraldine also owns Finn McCool’s Irish Pub and Rancho Chiquita Events, named after her 250-acre ranch where she hosts and caters many special events. She cross-trains her more than 50 employees and shares them throughout the restaurants and catering business. 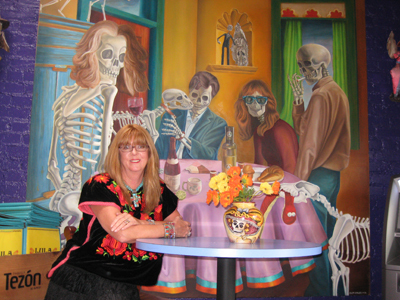 In addition to food, Geraldine is passionate about the protection and rehabilitation of abused and abandoned animals, a cause for which she frequently hosts and supports charitable activities and events. Here is a video of Thierry making a delicious Nutella crepes! 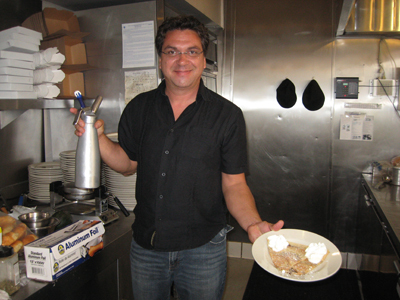 In addition to opening the storefront in 2000, Thierry also purchased a food truck, which he retrofitted to accommodate his crepes makers. Then he hit the studios and thus is one of the original gourmet-style food trucks. “We have our truck on a different lot every day – CSI, Grey’s Anatomy, The Office,” says Thierry. “We go to pretty much all of them.” Today, in addition to his catering truck and Hollywood food truck, Thierry is considering another food truck to focus on the street food crowd. In addition to 4 crepes makers on the Hollywood truck, 10 on the catering truck, and 2 in the restaurant, Thierry also has a small travel crepes maker for small parties and travel. “One time a guy flew me to New York to make crepes for him,” says Thierry. “I just pack my travel crepes maker and it’s easy.” Earlier this year, Thierry taught Chef Gordon Ramsey the crepes-making technique, he has also demonstrated on the Jay Leno show. 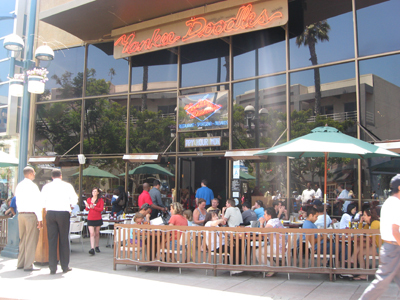 Kim Dubarry, General Manager of Yankee Doodles on the Third Street Promenade in Santa Monica, started in the restaurant business right out of college. 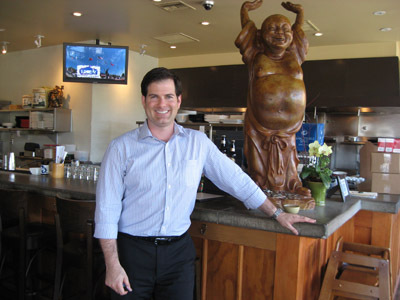 Her next move was to Tia Juanas Long Bar and Grill in Irvine, where she was also General Manager. Then early this year the owners of Yankee Doodles made the trip to Orange County to meet her, and she came on as General Manager in March of this year. With five offsite owners, Kim runs day-to-day operations, but still needs to be aware of the owners’ wishes and decisions. “Definitely the biggest challenge is working with offsite owners – making sure that we’re communicating,” she says. “You have to like what you’re doing to stay in any business this long,” says Kim. “I definitely like the people, and I like working with the owners.” With more than 100 employees and a capacity for 600 guests, Yankee Doodles is a large business that requires constant communication to maintain consistency. When I met Kim, it was about a week after the new Santa Monica Place opened, which features more stores and restaurants to attract tourists and locals to the Santa Monica Downtown area. “We have definitely noticed additional traffic from the new mall,” says Kim. He worked in film development for several years. “The industry was – and is – going through a transition, and I decided that I wanted to go into a different direction altogether,” says Stephen. 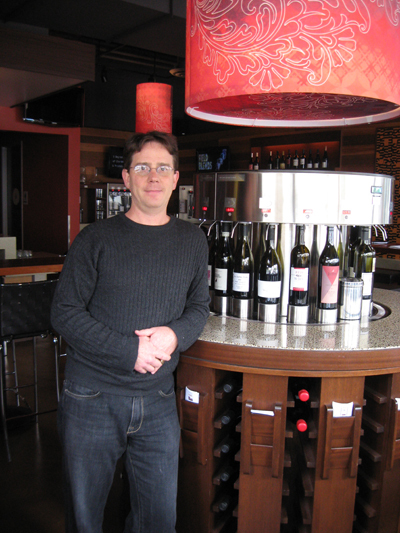 “It just became too hard to do the projects that I really wanted to do.” So in 2005, Stephen decided to open his own casual wine bar where he imagined he would have been able to go with his laptop and enjoy a glass of wine. “It’s a challenge to maintain the combination of high-quality with a casual atmosphere,” says Stephen. “I think we are still trying to set our guests’ expectations. It’s really about finding the right employees to convey the concept of the bar.” In addition to setting expectations, the staff also needs to be able to educate guests about how to order and operate the wine tasting machines, which offer a broad selection of wine by the ounce. 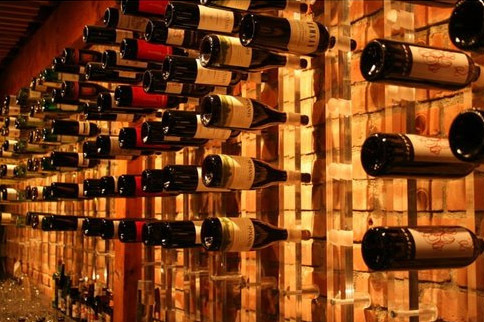 Because some people are looking for a simpler experience, they can also order wine by the glass. “We’re trying to teach people a new concept,” says Stephen. The Italian-made machines not only serve wine by the ounce, they also preserve the wine so that Pourtal can offer wine by the glass that normally wouldn’t be available. To promote the restaurant and bar, Stephen has made the patio section “dog friendly” and on Wednesday nights offers free dog walking services so that people can still circulate inside around the wine tasting machines. “We try to think of all kinds of fun events,” he says. 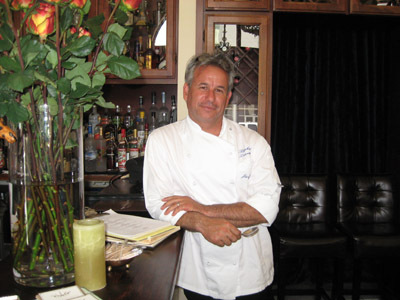 Jean Francois Meteigner, owner of La Cachette Bistro, was born and raised in France, and he remembers making and selling crepes with a friend that they proceeded to sell to their classmates. Of course – they ate many of the crepes themselves, too! Following that, he went to Bordeaux, where he worked at Le Chapon Fin restaurant for one year, went to the army for one year, and then returned to Le Chapon Fin for another six months before moving on to Paris. In Paris, Jean Francois worked at Le Chiberta, focusing mainly on appetizers and desserts. Then he went to L’ Archestrade – a three-star restaurant run by Chef Alain Sendereus. For a year he worked at the dessert, fish and meat stations. Jean Francois left France for Los Angeles in 1980 and soon found work at L’ Orangerie, which is no longer open. He started as a cook and became an Executive Chef at the age of 26 years old. After 10 years at L’ Orangerie, Jean Francois opened Cicada with a partners. After two years, Jean Francois sold his shares and moved on to become a consultant with the Bel Age Hotel. 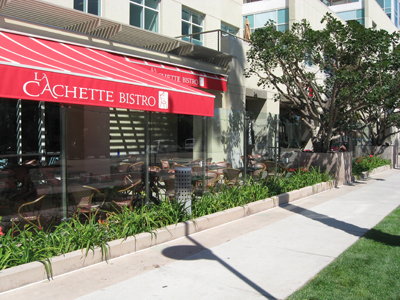 In 2008, Jean Francois began working on opening a second La Cachette in Santa Monica, but meanwhile renovations on Beverly Glen Blvd. made it increasingly difficult for guests to access the Century City location. “They basically locked up access to the restaurant,” he says. 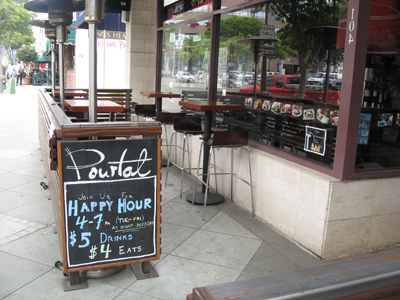 After serious consideration, Jean Francois decided to close the original location and move everything to Santa Monica. The new location opened August 28, 2009. Sixty percent of the menu at La Cachette is French, and all of it is prepared using French techniques, but there is definitely an international approach to food, including some sashimi and specials like beef chilli. “I was never too French,” says Jean Francois. “My grandfather was from Naples, and I cook a lot of Italian food, along with Californian and Asian … a blend of different styles. The truth is that I’m not that French anymore – I’m more American than French, and I don’t want to be stuck with just one style of food.” Everything for the restaurant is cooked on-site, including the smoked fish, desserts, fruit purees and breads (except for the table bread). Jean Francois says that he thought the transition from one location to the second would be easier, but he feels he is still getting used to the new space and clientele. The best part of the new location is the more functional kitchen, a newer building, outside seating and nice air quality. As for the hardest part: “The stress of the economy,” he says. “I don’t think it’s about how much I’m working or how great our food is right now – it’s about the economy. One week it’s busy, the next it’s slow. The restaurant business in a recession is hell – you have to watch every single penny.” To boost the restaurant’s visibility, La Cachette engages in lots of marketing. “We do everything – promotions, special events, blogs, Twitter – you name it, we do it,” he says. And for all of the stress that Jean Francois openly discussed (which I appreciated since most people don’t go into that during these interviews), he is obviously very happy being a restaurant owner. “I’m good at it – it is hard work, but I love it,” he says. 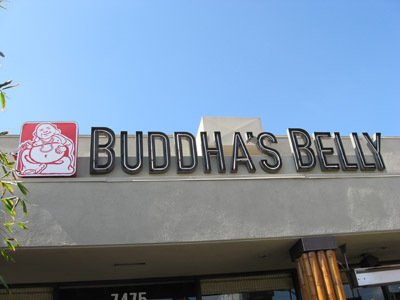 Evan Silver, co-owner of Buddha’s Belly, got his start in the liquor business – his grandfather was co-owner in Vendome Liquor, one of the most famous liquor stores in Los Angeles. Pioneers of the holiday gift basket, Evan found himself working in the store and making deliveries during school holidays. While he was in high school, his parents’ neighbor opened a cool new restaurant, California Pizza Kitchen, in 1985. “It was the ‘hot,’ cool place to eat and work,” says Evan. “I got a job there at sixteen as part of the opening team of the second location.” After just one summer, he was part of the team, and he continued to work when he could during breaks from high school and college. Soon after, Evan was promoted to management and ended up working in every CPK in the area. “I saw that there were lots of different ways to do the same thing,” says Evan. He settled in at the CPK Wells Fargo Center and was working there when the L.A. Riots broke out. “They (headquarters) called me immediately to make sure I was OK, which made me feel like I really mattered to them,” he says. After 10 months, Evan was called in by the HR manager, Don FitzGerald. “I wasn’t sure why I was being called in,” says Evan. “You just never know if it’s going to be something bad.” It definitely wasn’t bad … Don offered Evan the position of director of recruiting based on his knowledge of the company, his understanding of its culture, and the fact that he speaks Spanish fluently. In 2000, Evan felt that he was ready for a change. He was hired by an executive search company, where he worked for 2.5 years. “I was ready to stop telling someone else’s story and begin telling my story,” says Evan. In describing what it’s like to own a restaurant, Evan told me “Yesterday I brought a laptop and a pipe wrench to work – that’s a pretty typical of what it’s like to be in this business.” As for what he likes best about working in the restaurant business, Evan says it’s being a part of the community and watching customers achieve milestones over the years. 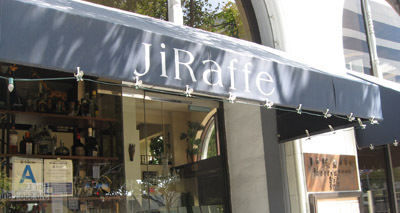 From a young age, Raphael Lunetta, owner of JiRaffe in Santa Monica, loved going out to eat. “Going to a restaurant seemed like a special treat,” says Raphael. 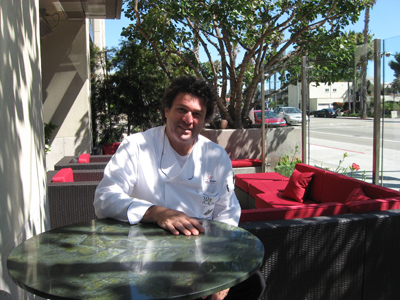 A Santa Monica native, his two passions are surfing and enjoying eating. “If it’s not good, I won’t eat it, but when it’s good food, I want to taste everything, order everything,” he says. Part of his passion for good food comes from traveling to France most summers from the time he was seven years old. His French mother would send him to stay with his aunt, who was an incredible cook living on the Spanish border of France. “We ate true French Provencal food,” says Raphael. “And there was a charming fishing village with restaurants, coffee shops, desserts … all of those images are what I associate with pleasure and enjoyment.” As an aside, Raphael told me that he even loved eating the food on his Air France flights! Raphael had his first restaurant job (as a busboy) in the eighth grade. “Dad was upset – he wanted me to focus only on school,” says Raphael. At heart, however, Raphael’s father could understand the passion for restaurants, as his own father (Raphael’s grandfather) was in the restaurant business. In high school, Raphael and his best friend Josiah Citrin would sell their records so that they could go out to dinner together. As a competitive surfer beginning in Junior High, Raphael focused on surfing and working at restaurants to support himself and to eat really good food. In fact, at that point in the interview, Raphael started talking about the quality of the staff meals at restaurants, and then he jumped up and brought me a sample of what his staff ate for lunch that day. It was delicious! After two years at Patina, Raphael and Josiah worked together on the opening team of a restaurant named Capri on Abbot Kinney in Venice. “We made very little money, but after eight months we got a little bit of buzz, and there was a line out the door,” says Raphael. The pair had an opportunity to work with Alan Jackson, and became co-chefs at Jackson’s Restaurant, and later Jackson’s Farm. 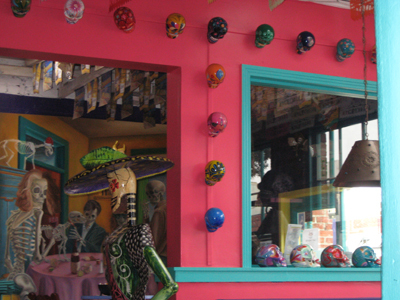 After several years, the pair became excited about owning their own restaurant again. “We were looking for locations and found this one,” says Raphael of the current location of JiRaffe. “It had been damaged in the earthquake and smelled like an Indian restaurant, but we negotiated a deal – with no money in the bank – and the landlord took a chance on us.” JiRaffe has evolved into an intimate bistro, and it gets high rankings for both service and food quality. Josiah sold his share to Rapahel and opened Melisse on Wilshire Blvd., but the two re-joined to create Lemon Moon on Olympic Blvd. “We do very well both together and separately,” says Raphael. Both have come a long way from selling their records in order to enjoy a meal out! Jason McEntee and Greg Seares were both in the advertising industry and were both getting ready to move on in 2001. Friends since college, they had previously both worked in cities that had great wine bars, and one night (over a glass of wine) they bemoaned the fact that Los Angeles didn’t have a great wine bar at which they wanted to hang out. There and then, they decided that if they couldn’t find one, they would build one. Within a few days, Greg was driving through Manhattan Beach, where both of them lived, and saw a location. He called Jason and the two began working with a Realtor. A few weeks later they realized that the initial location wasn’t going to work, but they were still committed to the idea. To save money, Greg and Jason moved in with Greg’s parents. “We figured it would be for 3-4 months,” says Greg. They held investor parties and had verbal commitments for the funds they needed within just one month. Then 9/11 happened, which shook everyone and derailed the plans. It took about six more months to actually pull in the money they needed, but they had it by Spring 2002 and signed the lease almost immediately. 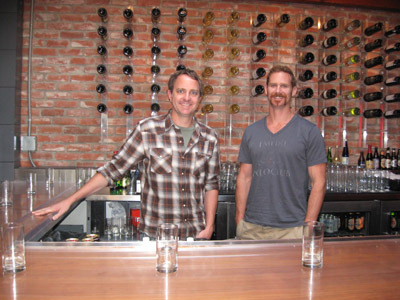 After getting the space up to their standards, the first Bodega Wine Bar opened at Paseo Colorado in December 2002. Greg and Jason ended up living with Greg’s parents for a total of about 18 months. 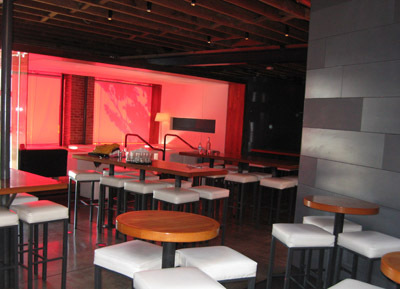 Within a few months, the first location was a success, and two years later they found a new location in Santa Monica – the Club Sugar. Raising money for the second location was easier than the first – all of their previous investors were eager to support them. They purchased the Club Sugar, took over the lease, and began renovations that were meant to last three months but extended almost 12 due to city restrictions. “We’re business people, not restaurant people,” says Jason. “I went into this with the most significant restaurant experience, and I was a host at Islands (I didn’t make it to server) and delivered pizza for Pizza Hut.” Rather than rely on their restaurant experience, Jason and Greg set out to create a business that met their needs as consumers. Their background in advertising served them well in creating a brand, while their deep roots in Southern California and proclivity for networking supported all of their marketing efforts. As partners, they have been able to complement each other’s skills. “He’s great at Excel; I’m great at Illustrator – it works out well,” says Jason. 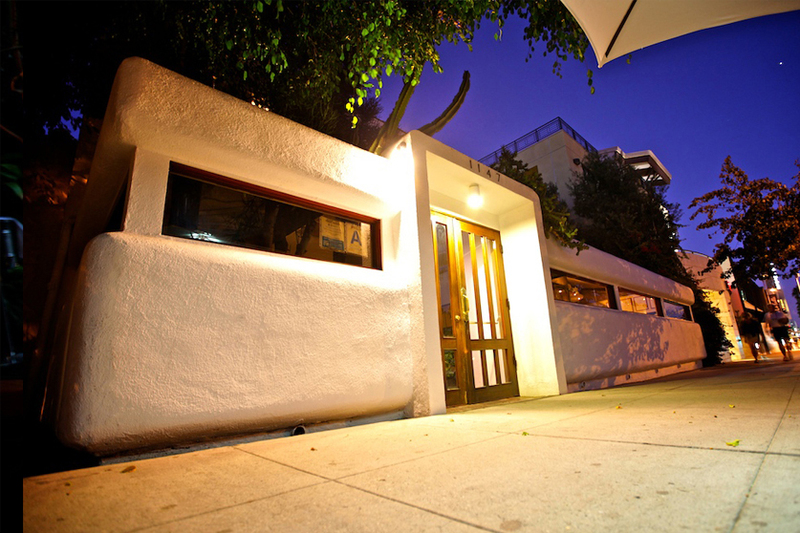 Jason and Greg are opening their third Bodega Wine Bar location in July in Hollywood at Sunset and Vine. As for further expansion, they’re taking it one place at a time. “It’s tempting to open more – to go big and get corporate,” says Greg. “But that’s not the life that we want.” Instead, they are working to make each location unique, to fit the local needs, and to hire people who make their customers feel welcome.